How was the Soviet Union like a soup kitchen? In this important and highly revisionist work, historian Sheila Fitzpatrick explains that a reimagining of the Communist state as a provider of goods for the ‘deserving poor’ can be seen as a powerful metaphor for understanding Soviet life as a whole. By positioning the state both as a provider and as a relief agency, Fitzpatrick establishes it as not so much a prison (the metaphor favoured by many of her predecessors), but more the agency that made possible a way of life. Fitzpatrick’s real claim to originality, however, is to look at the relationship between the all-powerful totalitarian government and its own people from both sides – and to demonstrate that the Soviet people were not totally devoid of either agency or resources. Rather, they successfully developed practices that helped them to navigate everyday life at a time of considerable danger and multiple shortages. For many, Fitzpatrick shows, becoming an informer and reporting fellow citizens – even family and friends – to the state was a successful survival strategy. 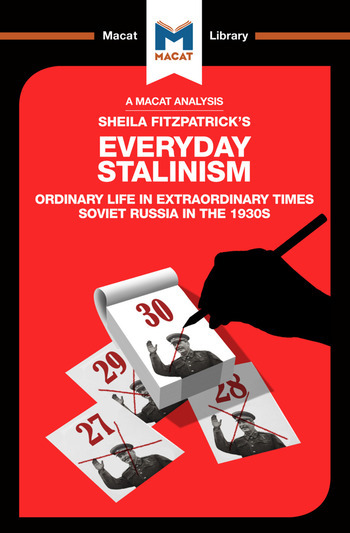 Fitzpatrick's work is noted mainly as an example of the critical thinking skill of reasoning; she marshals evidence and arguments to deliver a highly persuasive revisionist description of everyday life in Soviet time. However, her book has been criticized for the way in which it deals with possible counter-arguments, not least the charge that many of the interviewees on whose experiences she bases much of her analysis were not typical products of the Soviet system. Victor Petrov is a PhD candidate in Modern European History at Columbia University, where his research focuses on Eastern Europe. He received his BA (2009) and M.Phil. (2011) in Modern History from Oxford University.